You are the artist of your own life. Taking the world by storm, MAKE UP FOR EVER is a professional makeup brand for everyone. Since beginning in 1984, MAKE UP FOR EVER have always worked with professionals to stay on the cutting-edge of technological, formulistic and artistic advances to create high performance products for makeup fans and professional makeup artists all around the world. 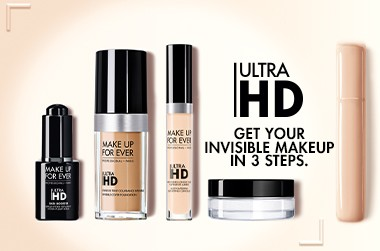 What is the MAKE UP FOR EVER difference? MAKE UP FOR EVER strives not only to be at the services of artists and to accompany them in their performance but also to help every woman embody who they really want to be each day. Create your own character, whether its an enhancement to show who you are, or trying out being someone new for the day. MAKE UP FOR EVER have created a professional makeup product to suit your mood, and your individuality. With endless enthusiasm and creativity for their craft, MAKE UP FOR EVER believe that “life is a stage” and you are the artist. With the latest in technology to create unparalleled products, MAKE UP FOR EVER are known for setting the trends. With an international, loyal brand following, you'll find MAKE UP FOR EVER in professional make up artist kits across the globe. Who is MAKE UP FOR EVER's Dany Sanz? Dany Sanz is the Creator & Artistic Director of MAKE UP FOR EVER. When she was a pro makeup artist in the eighties, there were very few products available that could provide the quality and range of colours that she needed for her makeup designs. Inspired by her own creations, and her students creations, she knew it was time to launch a range that accounted for both the needs of make up artists and their clients. Inspired by her work on every kind of set, from the theatre, to television, to cinema, Dany Sanz created makeup to withstand the rigours of life on the stage, and the demands of the set. Makeup was already her life, so inventing new textures and formulas came to her naturally! Adore Beauty is an official stockist of MAKE UP FOR EVER. Free shipping on all Australian, standard orders. Showing 20 products of 86.